Dr. Victor Yu is double board certified in Gastroenterology and Internal Medicine. He received his medical degree from the University of Southern California, Keck School of Medicine, and was the recipient of various scholastic awards in recognition of his academic achievements. He completed three years of residency training in Internal Medicine at the Los Angeles County/USC General Hospital, during which time Dr. Yu received the distinguished Resident of the Year Award as recognition as the most outstanding resident. He then completed three years of fellowship training in the Department of Gastroenterology and Liver Diseases at the USC Keck School of Medicine. 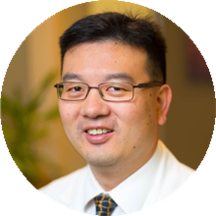 Dr. Yu has conducted a number of research studies in the fields of gastroenterology and hepatology and has published original research articles in prestigious peer-reviewed scientific journals. Dr. Yu specializes in medical disorders of the digestive system which includes the esophagus, stomach, small intestine, colon, liver, gallbladder, pancreas, and hemorrhoids. He performs an array of diagnostic and therapeutic techniques including upper endoscopy (EGD), colonoscopy, capsule endoscopy, small intestine deep enteroscopy, and bile duct/pancreatic duct endoscopy (ERCP). He treats acute and chronic GI problems and also focuses heavily on prevention of diseases such as colon and esophageal cancer. Dr. Yu is a Southern California native and is excited to be practicing in the area where he grew up. When not hard at work, Dr. Yu enjoys traveling, reading, golf, basketball, and photography. Dr. Yu joined with Drs. Paul Lee and Shahrooz Bemanian in 2010 to provide a comfortable and friendly medical office environment to meet the needs of their patients. Download the New Patient Forms in one convenient PDF document.